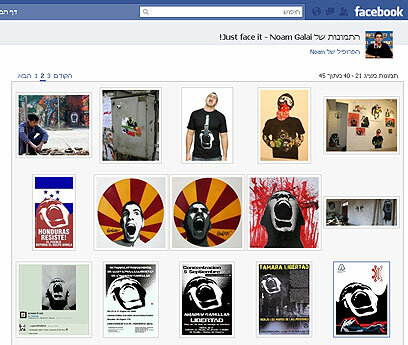 Fact: A graffiti portrait of 25-year-old Noam Galai is sprayed on several walls in Tehran. How did Galai's face reach a country that is not so fond of Israel, as well as t-shirts, posters, magazine covers, and playing among other things? The answer, in short, is Flickr Photo Sharing website. Galai, an Israeli photographer born in Jerusalem, said he's been taking pictures his entire life. After serving in the IDF's infantry unit he moved to the Big Apple for a one-year stint in a high tech company, which turned into four-and-a-half years. Aside from his job in the high tech field, Galai has also been working as a freelance photographer for the past five years. In the beginning of 2006, Galai shot a self-portrait for his personal portfolio. "I didn't see anything special in it at first." He told Ynet, adding that he left the file on his hard drive and didn't touch it. Four months later, Galai browsed through the folder containing the picture. "Suddenly I saw the picture sitting there, and said to myself – let's do something with it," he recalled. Galai uploaded the picture to Flickr's photo sharing website. From that point, it didn't take long for the picture to spread. Despite other social networks and file sharing sites such as Facebook and Picasa, Flicker still serves as a popular meeting spot for budding photographers, friends and people around the world. According to Flickr, Galai's face was viewed some 7,400 times. Flicker surfers simply find a picture they like, take it -- with or without consent – and use it for commercial purposes and art projects. This is exactly how Galai's scream T-shirt was born. 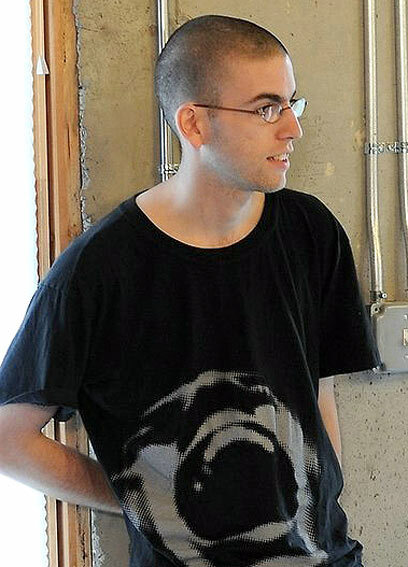 One day, approximately two years after publishing the photo, a co-worker asked Galai if he started selling t-shirts with his portrait on them. Galai replied that he had done no such thing. His peer said she saw a man on the subway wearing a shirt with his face on it. She asked the passerby where he got the shirt, and he told her it was offered for sale in several clothing stores across the city. After a brief investigation, Galai discovered that his face was 'for sale' in several stores around the world, as well as on the web. Apparently, someone simply took a liking to Galai's portrait on Flickr, and started selling it on a t-shirt for a price of up to $40. "Needless to say, this was done without asking for permission or paying me," said Galai. In response, Galai decided to print his own shirts for his friends and family, but said he was selling them cheaply and was not making a living out of it. On the other side of the scale, several magazines approached Galai and requested to publish his portrait on the cover of a political issue ahead of the United States elections in 2008. In addition, Galai found his portrait on a drawing of a high school student in Portland who also copied the picture from Flicker. "When she was done with the drawing, the teacher told her to leave it in school, so it is currently hanging in the hallway," said Galai, who recently discovered that his face was starring on different revolutionary posters, event invitations and even playing cards. But how did Galai found out that his portrait was adorning the walls of Tehran? "I didn't visit Iran," he joked, and said he used a website called TinEye, which traces pictures on the web. "Somehow, randomly, I spotted something that looked like graffiti of my face. I zoomed in and saw that it was really me. Later I discovered it was in Iran, England, Holland and every possible place," he said. "When I realized it was not an isolated case, I googled 'scream graffiti' and found many results," Galai added. How did Galai's screaming face inspire a graffiti template? Galai estimated that "in most cases, it was done randomly." Some of the images did not show clear symbols of protestation, but Galai believed that in some cases the 'scream' did symbolize freedom or revolution. Many photographers on Flicker allow free access to their pictures and even publish them under a CC license, which allows different usages without the artist's permission. Galai is slightly more protective of his work, and published it under the strictest usage license – all rights reserved. Galai even added protection measures to prevent surfers from copying his images on to their computers. Is he planning to sue those who copied his picture and turned it into commercial items? "Overall, this story is pretty flattering," Galai said. "Most of the things that were done are pretty cool and creative, so it doesn't bother me so much. "The only theft that bothered me is the shirts that are sold in the large retail stores. Each shirt is sold for $25-30, so they are making quite a profit on my expense," he noted. Galai said that at first he considered suing the distributors of the shirt, but eventually decided not to. "It's a waste of time and headache," he said, adding that "it is better to take it as a compliment and move on." Came across a picture of Noam on the street, on a garment, poster or any other item? He would love to hear about it. See all talkbacks "Israeli's portrait travels from NYC to Tehran"